I have posted few recipes using Beets so by now you should know my love for beets :). I wanted to make Beetroot Pulav from Saptha blog for long and was ready to do it during one of those raining weekend we had in SG ...but I realize Saptha had used cooked rice, I didn't had mood and patience's to do all that so I went for my short cut way and just made it like rice with the ingredients in hand. 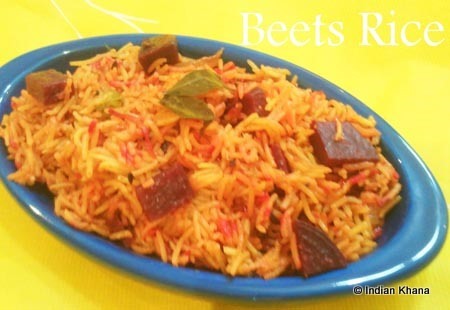 So here is simple, quick and easy beets rice ..a one pot meal, those days when you are lazy to cook :). ~ The pics are not very gud cause we had almost no light thanks to rain. 2. Peel and slice the onion, slit the chiles. Wash and soak the rice for 10-15 minutes. 3. Heat oil in pressure cooker add cumin seeds once it cracks add garlic and saute, add onion, chili and curry leaves saute until onion becomes pink. 4. Add chopped beets pieces and saute for a minute. Include all the spice powder and give a stir cook for 1 minute. 5. Add rice and mix everything well. Now add salt and water, check for spice and salt and adjust if required. 6. Close the cooker lid and pressure cook for 2 whistles. Serve with any raitha of your choice. BBB masala in it sounds good..I also add sambar powder to most of my rice varieties..does give a nice taste..
Rice looks very inviting. Liked the color of the rice. I have never cooked beets so far, weird is it? but yes :) I think I should change my mind and try this,sounds gr8! Addition of BBB masala sounds very interesting..Beautiful rice. @Raks, nope it's not weird at all...my affair with beets started couple of years before too..and now it's going steady :). Same pinch Priti, even I love beets. Pulao with bisi bele bhath masala! !, that tempts me. Thanks for sharing. Will try your version. @Sush ..that's wonderful to know ...let me know when you try. Looks v nice adding bisi bele bhath must have given it a v nice flavour...yummm!!! Colorful and yummy,rice looks so inviting. 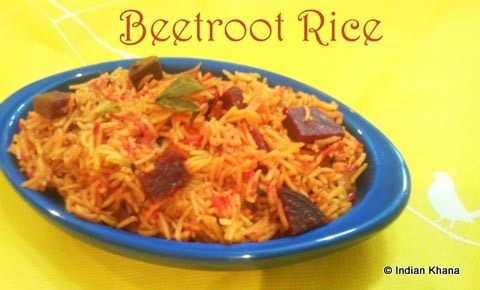 Love the colourful rice and yum yum..Am gonna bookmark this recipe..
Never had beetroot rice but this really looks good. I love it. I always love the color of any dish because of beets in it. Beautifully done dear. 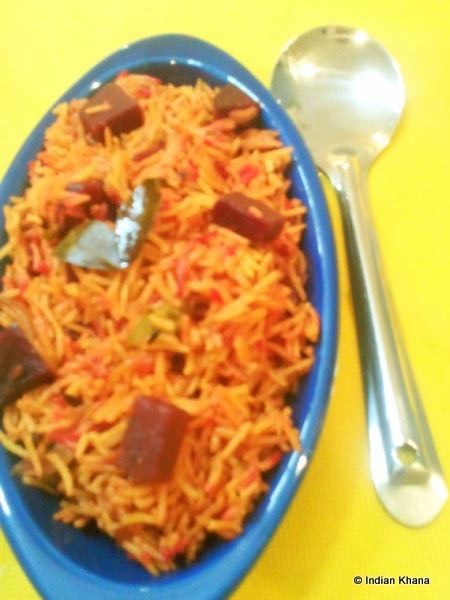 Beetroot pulao looks awesome with beautiful color. I love beets too and end up making a simple stir fry every time. This rice looks like a nice variation. I made a grated, raw beets raita from Anjum Anand's cookbook, and it tasted really good. @Faith ...try it ..I guess you will liked it. @Priya ...I was same like you ..always make stir fry and I simply love that but since DH doesn't like stir fry so I try to do different things! Beetroot rice looks so delicious. That's a nice food blog that you have here! will try your beetroot rice for sure. That is an interesting and easy one. thanks for sharing it priti. oh..wow...that looks healthy n delicious...thanks for sharing this! hv a nice weekend! tk care! Lovely and yum recipe.Here is something I have to inform you, I recently received awards from Reshmi of Easy Cook and abiding by the rules I chose 15 nominees and you are one of them.In my post I have drawn attention to the 'Your Trial' section of your post because I quite like it. If you wish you may collect the awards from my blog.All the best. Just my first time seeing beetroot rice. Sounds special. Lovely colorful Rice, Am sure the taste should be awesome! hey thanks priti for trying this recipe fom my site... And iam on the way to prepare the cabbage dal .. from ur site!! !